Get the checklist you need to use Twitter Moments effectively. What Exactly Is a Twitter Moment? Twitter tends to be chaotic, with Tweets on all manner of subjects flying at your constantly. The problem is, many of those Tweets have a common thread. They often make more sense when grouped together. Moments are a way to do just that. As you create and publish new Moments, they will become accessible from here. And of course you can share Moments so they appear in the main feed too. To give you a better idea of how they work and how some businesses are using them, here are a few examples from ordinary businesses who are starting to use Moments. This business bills itself as a ‘Global leader in assurance, tax, transaction and advisory services’. It based its first Moment on people working for the company who had Tweeted with the hashtag #AuditorProud. One way to use Twitter Moments is in relation to an event. This Twitter Moment from IBM relates to the #AviationFest where IBM presented some material. This is from a business @AppBrowzer offering to quickly turn your WordPress website into an app. Add a title for the Moment as a whole and a description that describes the collection of Tweets you want to create. The title can be up to 75 characters; the description up to 250. There’s no particular need to include hashtags. Hashtags within a Moment won’t be recognized by Twitter search. If you want to set a cover, you can do so now by uploading an image. Alternatively, you can wait until you have selected some Tweets to include in the Moment, and then choose a photo or video from one of them. 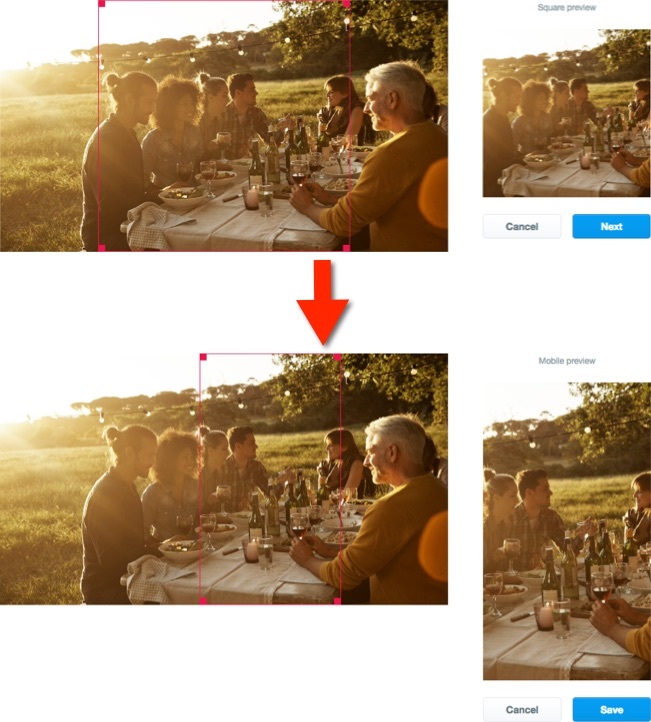 If uploading an image, you’ll be asked to first crop it for desktop, and then mobile. Choose some Tweets to be included in your Moment. You can move them up or down within it once added. Twitter recommend up to around 10 or so Tweets. More are possible, and they haven’t published a maximum number you’re able to include. Note that Moments can only be compiled from existing Tweets. You can’t create a Tweet solely for use within a Moment. It has to be already published as a Tweet. You can save the Moment as a draft at any time, and click Publish when you are ready for it to go live. However, don’t just share it the once. Schedule multiple shares of the Moment on Twitter as well as other social networks. You can see the finished Moment created in the course of putting this post together below. Keep your titles, short, but descriptive. Use the description to give people a taste of what they’ll find in your Moment. Your cover is like the cover of a book. Pick a great one that people can’t resist. 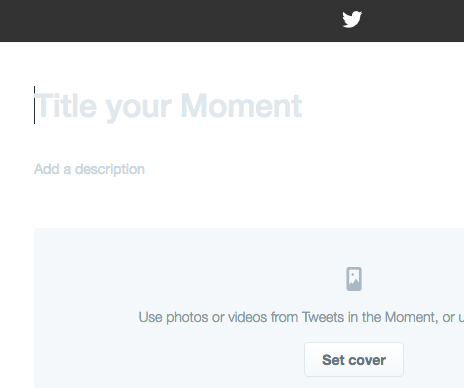 Your Moment can include anyone’s Tweets – yours, your friend’s, or the gal next door’s. Not too long, not too short. Keep your Moments snackable with around 10 Tweets. Bring your Moment to life with photos, GIFs, videos and Vines. Week’s top Tweets? Best GIFs of the day? All great Moments inspirations. 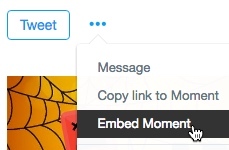 Click the ‘…’ next to the Tweet button on a Moment to get the code you need to embed it on your blog or elsewhere. 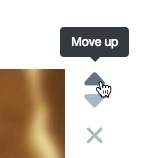 You can see examples of embedded Moments above. Once you create a Moment, find a suitable post or other content to embed it into. Events, such as business conferences or online chats and hangouts, now tend to have a common hashtag people can use when posting to social media about the event. You can see the example above from IBM. Find some suitable Tweets using the hashtag in question, preferably as posted by attendees, and combine 10 or so together into a Moment. For example, pictures and comments relating to different speakers during a particular day or the event as a whole. Curate relevant content on a particular topic from different sources in order to help your audience understand it. By doing so, you’ll also build your own authority. For example, identify a relevant topic, perhaps related to a blog post you wrote on the same topic recently. Look for suitable Tweets on the topic that make sense as a narrative within a Moment. Is there something newsworthy of relevance to your niche? Create a Moment based on a timeline of different Tweets related to the event. If there’s a hashtag related to your industry that’s currently trending, create a Moment by curating some of the best Tweets that use that hashtag. Share the Moment via a Tweet that uses the same hashtag. If you have a 10 Ways to… or other list-type post (or other type of content, e.g. 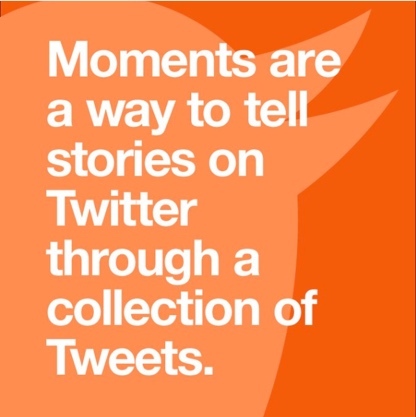 SlideShare), create a series of Tweets based on items in that list as a tweetstorm. Use different images (or even videos) to build variety. Link each one back to the original content. Create a Moment based on the full set as a way to collect them all together and build further exposure. Or could you encourage customers to send out such Tweets, e.g. for a competition, and using a common hashtag? Compile several of the best ones together into a Moment. Don’t just stop once you’ve created the Moment. Share your Moment after creating it. Schedule a series of Tweets that link back to it, share the link to it on other networks, embed the Moment in relevant blog posts and other content. If you’ve curated content from others, Tweet them a message letting them know they’ve been included together with a link to your Tweet that shares the Moment, rather than the Moment itself, as it makes it easier for them to retweet. Ask them to retweet it. Is there a problem related to your niche that you can help people solve with a series of Tweets collected together? Or perhaps there’s an issue that can be highlighted, such as a common complaint, that your company resolves? Create a product demo. Put together a series of Tweets that tell a narrative and demonstrate how to use your product. For a weight loss product, it could present the story of someone succeeding. Progressive Tweets could present the timeline, like an extended before and after shot. Perhaps you’re in the wedding business. Put together a series of Tweets relating to each specific wedding. It’s something the bride and groom and no doubt their guests would delight in sharing on social, helping you build the visibility of your business. 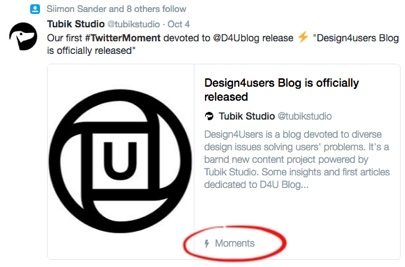 Start experimenting with Twitter Moments as an additional way to connect with your marketplace, attract new followers and build your online visibility and authority. 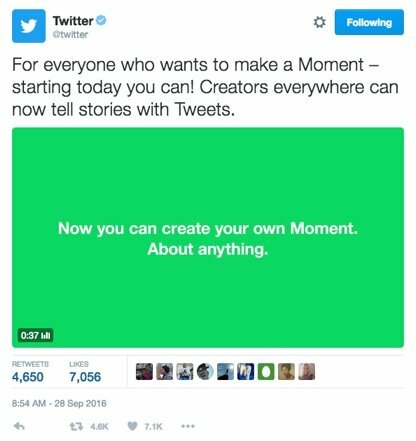 Collecting existing Tweets together in different ways to create new Twitter Moments for your business only takes a few minutes. Remember to get the checklist you need to use Twitter Moments for future reference. How cool! Thanks for the wonderful explanation. I’ve just created my first Moment! Hi Catherine, you’re welcome, and great to hear!